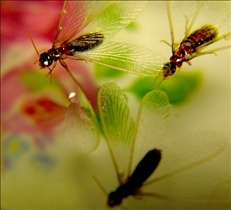 For many people, flying ants and termites mean only one thing: trouble. There are very few places on the planet where such critters haven’t posed a threat or at least a considerable annoyance and many people are happy to simply have them out of the way. Nevertheless, the two types of insects are actually quite fascinating and distinct in their own rights, and this comparison article should clue you in to some of their more adorable characteristics. The clearest indication of the difference between flying ants and termites is their body shapes. Flying ants’ bodies are characterized by three distinct segments: the head, thorax, and abdomen. The joints that connect these segments may be likened to the neck and the waist in humans, although they of course don't have similar functions. As for termites, the bodies are comprised of only two segments, with the head and the thorax joined together in what appears to be a single piece. In addition, ants may range in color from red to black, while termites are usually totally shiny black. The wingspans of both insects should also provide a clue as to their differences. Both types of insects develop two pairs of wings for mating and reproduction purposes, and also for seeking out new colonies, although they have strikingly different appearances. While the termite has back wings that look shorter than the front wings, stretching them out reveals that they are actually of the same length. 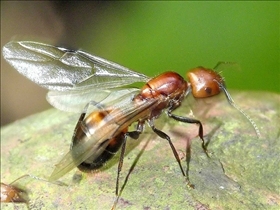 On flying ants, the back wings are tucked underneath the front wings and are quite a bit shorter. Both types of insects’ wings have tiny veins on them, but the termite's wings are more prone to fall off than flying ants’ wings are. This is why you often see termite wings scattered about where they have previously swarmed. The antennae of both creatures reveal more differences. The antennae of flying ants have a pronounced curve or inward bent shape, and the tip is marked by a ball-like feature called a club. In contrast, termite's antennae point outwards without any discernible bends, and there are no knobs at the end either. Termites are of course often found near or in wood, which is where they typically nest and feed. As for flying ants, they are more likely to be found in places where they have ready access to fruits and/or sugar. Which flying bug is more annoying?